Lucy is 21 and, when not writing, can usually be found procrastinating on social media or spending far too much time making cosplays to wear at conventions all over the UK. Lucy’s writing career began in the illustrious world of Harry Potter fanfiction when a diagnosis of Chronic Fatigue Syndrome at age twelve left her with a lot of free time on her hands and unfettered access to the internet. Fandom is still a very large part of her life, though she has since moved into creating her own fantasy worlds. Her first two books are part of a planned 6-book series spanning the history of the steampunk world of Tellus. 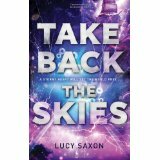 The first book, Take Back the Skies, was penned at the age of 16 as part of NaNoWriMo. The third book will be released in January 2017. Lucy lives in Hertfordshire with her parents, brother and dog, with occasional jaunts to the mountains of Arkansas to pretend to be a cowgirl. Find her on Twitter @Lucy_Saxon, on Tumblr and on her website. Take Back The Skies: Catherine Hunter is the daughter of a senior government official on the island of Anglya. She’s one of the privileged – she has luxurious clothes, plenty to eat, and is protected from the Collections which have ravaged families throughout the land. But Catherine longs to escape the confines of her life, before her dad can marry her off to a government brat and trap her forever. So Catherine becomes Cat, pretends to be a kid escaping the Collections, and stows away on the skyship Stormdancer. As they leave Anglya behind and brave the storms that fill the skies around the islands of Tellus, Cat’s world becomes more turbulent than she could ever have imagined, and dangerous secrets unravel her old life once a nd for all. The Almost King: Aleks Vasin is the youngest of four brothers, each with his path mapped out. But Aleks doesn’t want to work in his father’s shop in a village in the westernmost corner of Siberene for the rest of his life. Tired of being picked on and treated like the runt of the family, he decides to save his parents the cost of his keep and leave. First he heads south – though everyone tells him not to – to Rudavin, headquarters of the Kingsguard. He signs up for the army, little knowing what brutality it entails. After only a few weeks, Aleks realises that this garrison is full of liars and thieves; he’s signed away four years of his life to a commander who steals his money and a captain whose only goal is power. This is not a noble destiny. After a brutal beating, Aleks escapes into the night, hoping to find safety and a new life somewhere in the north. 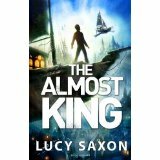 And there, this deserter finds love, adventure and a skyship in which he might just prove himself a hero after all.